British motorists with fully-electric cars can drive 1,000 miles for just over five pounds by using solar energy, according to new figures released today from British Gas. 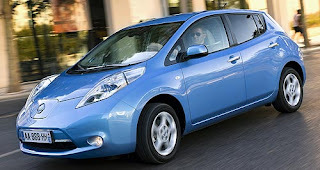 With high petrol prices, households with fully electric cars such as the 100% electric Nissan LEAF can install solar panels and use the energy produced to offset the costs of running their car. Actor Robert Llewellyn, best known for playing Kryten in cult British comedy Red Dwarf, is one of the first motorists to run his car with the help of solar panels. Since having his panels installed by British Gas three months ago, Robert has clocked up 2680 miles in his Nissan LEAF. Thanks to his solar panels, he has generated enough energy to provide 85% of the charge required to cover this distance1. As a result, his journeys have cost him a fraction of the amount the same mileage would set him back if he had used a petrol powered car. Cost comparisons per 1,000 miles(2). As well as providing the home with free renewable electricity, solar panels also provide an annual income thanks to the Government's Feed-in Tariff (FiT). The scheme rewards solar owners for all the renewable electricity their panels generate, earning a yearly income. The payments are tax-free, index-linked and guaranteed for 25 years(3). The cost for a 2.52kWp solar panel installation like Robert's is £11,500 from British Gas. With the average driver travelling 12,000 miles a year(4), an electric car owner with a solar array of this size can expect to save over £1,736 on petrol costs with an estimated annual FiT payment of £1,055(5). These benefits add up to a total of £2,791 annually. This means the solar panels will pay for themselves in just over 4.5 years. Robert Llewellyn said: "I'm a massive fan of electric cars, and have been for years. With solar-generated electricity, I don't have to worry about the price at the petrol pump. "Using solar energy is a fantastically efficient way of getting around and I've been amazed at how much energy has been generated even in our typically English, cloudy weather." Dean Keeling, Managing Director of British Gas Smart Homes, said: "Through solar-generated energy, our customers can significantly cut their fuel costs and help reduce Britain's carbon footprint. Solar-charged vehicles have real potential on our roads, and from the moment the panels are installed customers can begin to reap benefits." British Gas is the also the preferred supplier of home charging units for the Nissan LEAF electric vehicle, the new Zero Emissions range of Renault EVs, as well as Hitachi Capital's EV lease offering. The preferred partnership deals mean British Gas is on track to be the largest supplier of car charging points in Britain's homes, supporting 70% of the domestic market by 2012(6). Home owners can also benefit from British Gas' Rent Your Roof Scheme. It is an option open to both British Gas and non-British Gas customers that allows people to generate their own electricity and save on their fuel bills without the capital outlay of a solar PV system. If your property is suitable, British Gas will pay for the system and installation of PV panels on your roof. Home owners in this scheme will benefit from renewable electricity but will not receive the feed-in tariff.